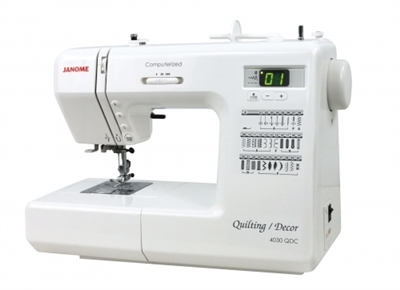 The 4030 Quilting/Décor is a Computerized sewing machine with fabulous features desired by sewists and quilters alike. Its bright, easy to read LED display and touch-button selection allows quick access to the 30 built-in stitches, including 6 styles of one-step buttonholes. Extra-wide seam markings on the bed of the machine are great for home dec applications, and the feed dog drop and start/stop button are handy for quilting projects.